I read this article and found it very interesting, thought it might be something for you. The article is called Why India’s Most Educated Women Are Leaving Jobs Faster Than Others and is located at https://archive.indiaspend.com/cover-story/why-indias-most-educated-women-are-leaving-jobs-faster-than-others-48137. New Delhi/Gurugram: It was while working for a shopping website that Parul A Mittal, 43, discovered her calling as a writer. It was 2008. She had been working for 12 years, was at middle management level at her company and no reason to quit. Except her younger daughter had just begun showing signs of a breathing problem, and Mittal was at that stage in her life where her husband was immersed in his job at a venture capital firm. “I used to feel mentally and physically exhausted all the time,” she said. It was at this time that Mittal wrote her first book, Heartbreaks & Dreams: The Girls@IIT. With a degree in electrical engineering from Indian Institute of Technology, Delhi, and a Masters in Computer Science from the University of Michigan (Ann Arbor), Mittal had tried it all–part-time hours, freelancing, a sabbatical. For a while she even ran a parenting website, but shut it down in 2016 when it reached a point where ‘you take funding and scale it’ or close shop. Still, she didn’t give up on the tech sector until earlier this year with her last job at a travel portal in a ‘pretty senior role’ as the only woman vice president in the company. With it came not just the office politics but a requirement to commit herself to the job 24×7. Even that might have been tolerable. The deal-breaker, however, was the office culture where the other staff seemed happy to stay on till 8 pm and beyond. “For me, 6-8 pm is sacrosanct. It’s pretty much the only time I get with my family,” Mittal said. So, although both her daughters were fine with her absence from home, although she had hired help with housework, although she had in-laws who pitched in, she put in her papers in February this year after completing 11 months with the company, ending a career spanning 20 years. “That job finally purged the desire in me to work in the corporate world,” she said. Later this month, she will be launching her third book, Let’s Have Coffee, published by Rupa. Mittal is just one of millions of Indian women who have been falling off the employment map in India, as our ongoing series has reported. But as this story explains, she represents a special category of women. In eight years to 2012, 19.6 million women quit (or lost) jobs. This decline is evident whichever way you slice the data: Rural or urban, formal sector or informal, illiterate women or post-graduates. The biggest decline has been amongst two groups–illiterate women and post-graduates, according to a 2017 World Bank report, Precarious Drop: Reassessing Patterns of Female Labour Force Participation in Indian. There was an 11.5% decline in the workforce participation by illiterate women in rural areas. In urban areas, workforce participation for illiterate women was 5%. Workforce participation amongst college-educated women fell by 8 percentage points in rural India and 4 percentage points in urban India between 1993-94 and 2011-12, said the report. Why would a woman with a college education quit employment? A clue might, perhaps, lie in college. There’s no shortage of women science teachers in schools and colleges in India, found a 2015 report from the Association of Academies and Societies of Sciences in Asia. A gap emerges during the transition from acquiring degrees to pursuing a career in science. Unlike many western countries, in India, the issue is not about convincing girls that they can study science and engineering. It’s more about “how to attract women to a career in science and to retain the trained scientific woman power in science”, said Rohini Godbole, vice president of the National Academy of Sciences and the author of the report’s India annexe. Women are fairly well represented in engineering and medical college in India. Admission data for 2000-01 showed that women comprised 30% and 45% of students in engineering and medical colleges respectively, found the same report. But when it comes to the elite IITs, the numbers just dwindle to single digit percentages–8% in 2016, 9% in 2015 and 8.8% in 2014. Even when women get into the IITs, they are less likely to qualify for the top-ranked ones. For 2017, only 20.8% of students who qualified were women, indicate results for the Joint Entrance Examination (JEE)–Advanced, the test designed specifically for the IITs and recognised internationally as one of the toughest undergraduate admission tests. Moreover, 93.2% of the top 1,000 positions were taken by men. Yet, said Godbole, although the fraction of women students in the IITs is small, the gender gap amongst high achieving students is negligible. Why aren’t more girls getting into the IITs? But getting parents to pay for their daughter’s coaching classes is only one problem. Coaching classes, without which it seems impossible to qualify, could be far from home and held late into the evening. In the absence of safe public transport in Delhi, Baani Leen Kaur Jolly, currently a second-year student at the Indian Institutes of Information Technology, Delhi, recalled how her father would leave work early just to drop her off to coaching classes and then return to pick her up–6 km each way. Even now, late night hackathons in college are only possible because her father offers to pick her up. “I’m lucky,” she grinned. But, “to produce more women leaders and role models, you need to have more women enrolled in top institutes of science and technology”, said Ashutosh Sharma, an IIT (Kanpur) professor who is currently secretary, Department of Science and Technology. One way to do this is by creating a level playing field. It’s an urgent problem and one that is sought to be tackled through various schemes, including one to increase the number of seats and earmark these for qualifying women. Some IITs are also reportedly considering a fee waiver to deserving candidates. Starting from 2018, the government will identify 50,000 girls from different school boards in the country. These girls will receive a fellowship to complete their 11th and 12th grades in school and will also be invited to attend science camps and special classes on various IIT, IISER (Indian Institute of Science Education and Research) and university campuses. “The idea of science camps is not only to tutor top performers amongst girls for competitive exams, but equally important, to expose them to various role models that address a range of cultural and scientific issues to enable them to take up an education and career in science, especially in areas that witness a huge under-representation of women,” said Sharma. At entry-level tech jobs, women actually have a slight edge with 51% of all jobs, according to a 2011 study, Diversity in Action, from trade association Nasscom and PricewaterhouseCoopers. Overall, the 1.3 million women employed by the Information Technology and Business Process Management (IT-BPM) industry make up 34% of all employees. Yet, how do 51% of women at entry dwindle to 34%? At what stage do they quit? And why? High potential men and women in India start out on an equal footing when it comes to job levels, pay and even aspiration, found a 2014 study, High Potentials Under High Pressure in India’s Technology Sector, by Aarti Shyamsunder and Nancy M Carter for Catalyst, a nonprofit with a mission to expand opportunities for women and business. But, over time, a gender gap emerges with women earning less, receiving fewer developmental opportunities that lead to advancement and bearing more responsibility at home compared to men. To do this, companies must have zero tolerance for prejudiced comments and behaviour, encourage senior leaders to serve as role models and engage men in diversity and inclusion efforts, said Beninger. Earlier this year, Debjani Ghosh quit her job as Intel’s managing director for South Asia. She spent 21 years with the company and while she was proud of everything she had achieved and contributed, she felt the time was right to “step out of my comfort zone and follow my passion of accelerating local innovation to use technology to connect with the next billion in India”, as she explained. Ghosh believes this is an exciting time for India and the role of technology in shaping the future. “The startup ecosystem and our hidden asset, India’s women, will play a key role and these are the two areas on which I am focusing as a mentor and an angel investor,” she said. Most women tend to quit jobs when they are in middle management positions, either because they have children or because they are at a stage in life when parents might need support and care. With a degree in electronics engineering, Shalini Saluja, 47, was always interested in fashion and even convinced her then employer to sponsor her for a three-year course in fashion design. Soon after the birth of her daughter, her mother-in-law became bed-ridden and her father-in-law was diagnosed with cancer. With a husband immersed in his job in logistics and shipping, the modern woman’s work-life tango became impossible and Saluja soon had to quit her job. “My in-laws were very modern but made it clear to me that my career came second after my family. I was expected to cook dinner after I came home from work,” she said. Yet, there is a silver lining to Saluja’s tale. Determined not to let her skills go to waste, Saluja now runs a sustainable clothing line, Indie Cotton Route, that sources material from rural artisans to make customised garments for clients. The business runs out of her house. Companies, at the least the ones that want to retain female talent, have been devising ways to plug that leaking pipeline with an assortment of maternity schemes, return-ships and flexi-hours. A 2015 survey by Catalyst, India Inc: From Intention to Impact, surveyed 42 firms with a total employee base of 400,000 to find that 64% had a dedicated staff working towards the development and advancement of women employees. But, it also found that schemes often fall short because senior leaders are not held accountable for gender inclusion. “Holding leaders accountable for translating intent into impact can be a crucial game-changer for India Inc,” noted the report. A chance meeting at a conference between Aparna Saraogi, an IIT (Delhi) alumnus, and Sarandeep Singh, a PhD in decision and risk analysis from Stanford University, led to the formation of WEE (Women empowerment and entrepreneurship) Foundation in 2016. The two began talking about the obvious lack of opportunity for women entrepreneurs. “A lot of women have great ideas but sometimes don’t know how to translate these into business ventures,” said Saraogi, who continues with her day job as an investment banker. Just over a year old, WEE partners with IIT (Delhi) and the government’s Department of Science and Technology to train women entrepreneurs through a three-month programme on running their own business. The three batches of fellows so far have ranged in ages from 19 to 57, with business ideas from augmented reality to 3D printing. 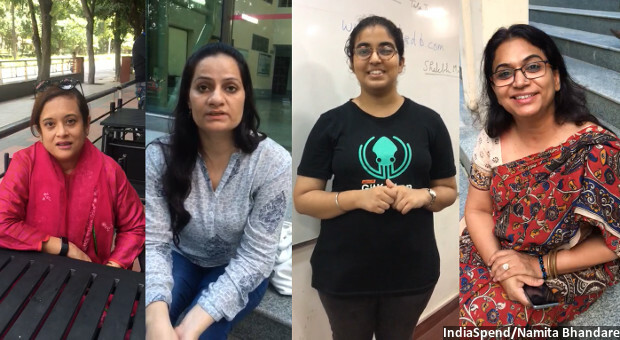 On a recent Sunday at the School of Information Technology in IIT (Delhi), there was no shortage of enthusiasm, energy or ideas in the class of 35 women. Radhika Adholyea, a practicing gynecologist, runs a portal, UniWorld Health Solutions, which will connect domestic and international patients to appropriate healthcare facilities and doctors. The startup world is hard for women who encounter everyday bias and stereotyping at work, said Aparna Jain, consultant and author of Own It: Leadership Lessons From Women Who Do. “It’s tough even for strong, independent women who at some point might feel, ‘forget this, I’d rather stay at home’,” she said. Unsurprisingly, only 9% of Indian startup founders and co-founders are women, found a 2015 Nasscom report. Of the $5 billion (Rs 30,545 crore) funding received by Indian startups in 2015, funding received by women-led startups was no more than 3.6%, or $168 million (Rs 1,026). Ashwini Asokan, the 35-year-old CEO of Mad Street Den, an AI and computer vision start-up, has had a clear approach to the company ever since she founded it in 2014 along with her husband, Anand when they returned to India from California: Is the company ‘balanced’? “It’s not just in terms of gender, but also in terms of age, skill sets and personality,” said Asokan. The impact of having women represented so well is evident. There’s a space for a nursing room to breast-feed or pump–Asokan had her younger child, a son, while she was raising funds for the company ‘traveling with my breast pump on day trips while pitching to VCs’–and a play area where kids (and dogs) are welcome to hang out after school while mummy (though just as often daddy) works. This is the fifth part in an ongoing nation-wide IndiaSpend investigation into India’s declining female labour force participation. I am a dentist, quit five years back to go into hypnotherapy full time. We are scared to delegate. Till my kids were at school, I practised dentistry, I taught theatre, dropped & picked my kids from school. I gave up travel, which I love. Now that my kids are older, I travel, manage my clinic and my dad’s clinic and I am fine. I am not a super woman. I have been brought up by people who took responsibility for their choices. It would be interesting to know why these women needed excuses to quit what they were doing.